“A man accused of driving a van into a group of people outside a London mosque in June “conjured up a defence out of thin air”, prosecutors have said. Darren Osborne had intended to kill as many Muslims as possible, said Jonathan Rees QC in his closing statement. 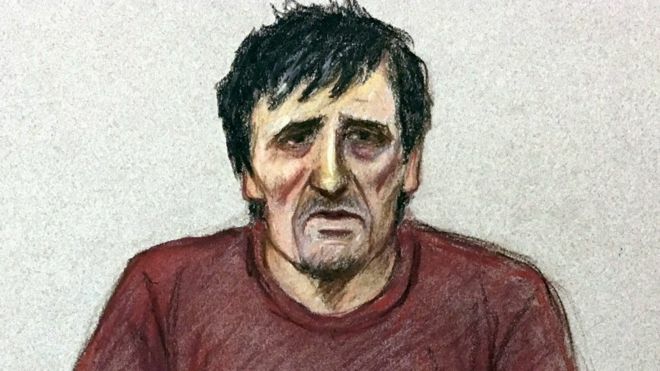 Mr Osborne, 48, who denies murder and attempted murder, says a friend called Dave was driving the van when it hit people in Finsbury Park, killing one. But Mr Rees said Dave’s participation was “plainly fabricated”. “You know why he is lying, because despite all of his talk, the defendant doesn’t have the courage of his convictions. He has sought to blame someone whose involvement he’s invented,” he told Woolwich Crown Court. Mr Rees said Mr Osborne’s two contradictory statements during his trial told the jurors “everything you need to know about the defendant’s approach to these proceedings”. He urged jurors not to allow Mr Osborne to “pull the wool over your eyes”, adding the defendant’s motivation had been “a warped hatred of all Muslims with its roots in material he had watched on TV and online”. Earlier, Mr Rees challenged the defendant to explain why Dave had not been seen on CCTV getting out of the van after the collision, in which nine people were also injured. And he insisted that Dave had not been made up.